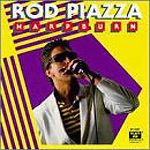 Maybe it's his California surfer good looks, but West Coast blues harpist Rod Piazza hasn't gotten the attention and acclaim his playing deserves. "Harpburn" is a re-release of a 1985 album on the small Murray Brothers label, and features Piazza fronting a couple of early versions of his current band, the Mighty Fliers. Then, as now, the Fliers (with the equally underrated Miss Honey on keyboards) put out some of the most electrifying boogie blues to be found. This is definitely uptempo music; contemporary electric blues/R&B with Piazza's growling harmonica leading the way and Miss Honey's Kansas City-styled comping anchoring the effort. Piazza is a very strong singer as well, with his throaty vocals a nice match for his energetic music. This is a heck of a good album, and it's nice to have it back in print.